Are you interested in Ancel Scanner? Or you are finding a suitable scan tool? In this article are 5 of the best Ancel scanners for your consideration. We have also reviewed each one by highlighting its main features, pros, and cons. It’s a short read, but just in case you don’t have the time to read the whole of it then perhaps the comparison table below may help. First, the AD310 makes it so easy to retrieve trouble codes, identify faults and possibly fix them. With a sturdy, classic design, this AD310 is not just a top-performer but an attractive gadget as well. Moreover, it has all the features that you may need in a basic code reader. This Ancel code reader works on all the mainstream vehicle brands that are OBD2 compatible. It specifically covers 1996 and newer US-based vehicles as well as 2000 and newer Asian and EU-based vehicles. Furthermore, the OBD2 port is usually located either under the dash or just below the panel that holds the handbrake. Once you find the 16-pin port simply plug this code reader and you’ll be set to perform diagnostics. You may want to know that the scanner will only work if your vehicle runs on a 12V battery. Primarily a code reader, the AD310 reads and clears fault codes in the ECU (engine). Such faults usually bring the Check Engine Light on, so by clearing them the light will switch off. That is to say, this Ancel code reader reads manufacturer-specific, pending and historic codes. Additionally, the scanner runs I/M readiness (smog) tests. And you can use it to retrieve a vehicle’s information (VIN). It also provides live data streams and freezes frame data during diagnostics. That is basically full OBD2 functionality. At 8.9 x 6.9 x 1.4 inches, this Ancel code reader is a handheld device. Its weight is just 12 ounces, which shouldn’t be a problem to handle. On the front side is a large LCD display with a resolution of 128 x 64 pixels. The full-color screen makes navigation quite easy. Handy device for turning off the check engine light and running smog tests. An intuitive interface makes it easy to navigate. Very affordable despite having high-end features. The built-in library provides definitions for codes. Comes with 3-year manufacturer warranty. Will not diagnose systems beyond the car’s engine. Code definitions provided are not very clear, especially for beginners. Despite those few drawbacks, this best Ancel scanner is an amazing buy for beginners and ordinary car owners. The AD310 provides the basic functions that you may need. That is essentially reading and clearing engine codes so as to reset the check engine light (MIL). 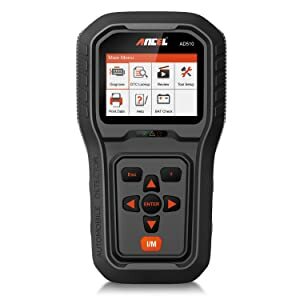 Primarily a code reader for the ECU, the Ancel AD410 will tell you what’s going on with your car before you take it to the shop. It runs diagnostic tests to determine engine-related faults. The scanner is compatible with all 1996 and newer models of vehicles. 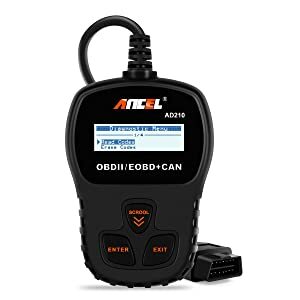 Such vehicles are OBD2 compatible and feature a 16-pin OBD2 port where this Ancel code reader connects. You can find it either under the dash or below the handbrake panel. Simply plug the device in the port and it will be good to go. It will initiate the diagnosis process automatically as soon as you turn on ignition. However, never mind those technical terms. They only mean the scanner can read and clear all OBD2 codes in a vehicle’s ECU (engine system). And what that means is that you can use it to identify engine DTCs and switch the Check Engine Light off. Moreover, the Ancel code reader features a built-in lookup library with code definitions. Whenever you see a code that you don’t understand simply click on it and you’ll get a brief explanation. That’s precisely why this scanner is suitable for ordinary car owners and beginners alike. In addition to codes, the AD410 also performs I/M readiness tests, O2 sensor tests, onboard monitor tests, and EVAP system tests. All those tests ensure that the car’s fuel system is efficient. so, the I/M test will tell you whether the vehicle’s emissions are within the required standards. Then, the code reader provides data in form of the live stream and freezes frame. You can also retrieve a vehicle’s information (VIN). A handheld device, the AD410 measures 9.1 x 6.4 x 1.5 inches. It has a weight of 11.2 ounces, which is pretty nice for portability. Fitted on the scanner is a2.4-inch TFT QVGA screen for navigation and viewing of diagnostic results. The interface is very intuitive, you don’t really need a manual to find your way around the menus. If you wish to print out diagnostic results you can do so by clicking “Review and Print”. The scanner comes with a USB cable to PC connectivity. The main function os AD410 is to read and erase error codes, reset monitor when the CEL come on. Supports full OBD2 diagnostics plus additional special functions. Provides clear test results thanks to the TFT screen. Apart from the engine, it doesn’t support the diagnosis of other primary systems like ABS, transmission and SRS. Troubleshooting definitions and tips provided are not very clear, especially for beginners. Despite that slight drawback, the Ancel AD410 is in fact designed for beginners and ordinary car owners. It is simple to navigate and offers the basic functions that such a person would need. I.e. resetting the MIL and running I/M readiness, O2 senor, EVAPsensoronboard monitor tests. A highly acclaimed code reader, the Ancel AD510 is loved for its simplicity in design and superiority in performance. It combines rugged construction and handy functional features in an affordable unit. 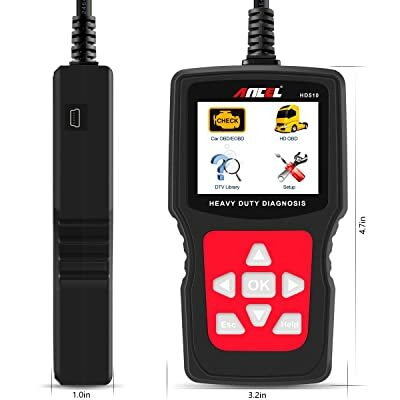 This Ancel code reader works on OBD2 compliant vehicles. Typically OBD2 vehicles are those made from 1996 to date. However, the AD510 supports 1996 and newer US-made, 2001 and newer European-made and 2005 and newer Asian made models. It also works on a diesel vehicle, as long as the vehicle uses a 12V battery. To start a scan, simply plug the scanner to the OBD2 port and then start the vehicle’s ignition. The device will power up and initiate a scan. The Ancel code reader can also be used for I/M readiness, EVAP system and O2 sensor tests. These tests are meant to ensure that the engine is using fuel efficiently. They also show whether your car’s emissions are within the required standards. Finally, the Ancel AD510 performs battery checks and monitoring. It will tell you the status of the battery in real-time. That voltage info generally also protects the car from excessive voltage. A 1.5 pounder, this Ancel code reader measures 10.1 x 7.3 x 3 inches. Its body features a rugged and anti-shock exterior that shields the device from damage under impact. It is also an anti-slip, which makes it ideal for auto works. Besides the 2.8-inch TFT screen, this code reader also features three LEDs that provide light notifications during I/M readiness tests. Actually, there’s a dedicated I/M key to a one-touch diagnosis. This Ancel code reader you can view live data streams, live PCM, playbacks and freeze frame data. It can also store diagnostic information. And It also retrieves VIN, CIN, and CVN of a vehicle. The included in the package is a USB cable for connecting the code reader to a PC. With that connection, you can print diagnostic info and also upgrade the scanner’s software online. 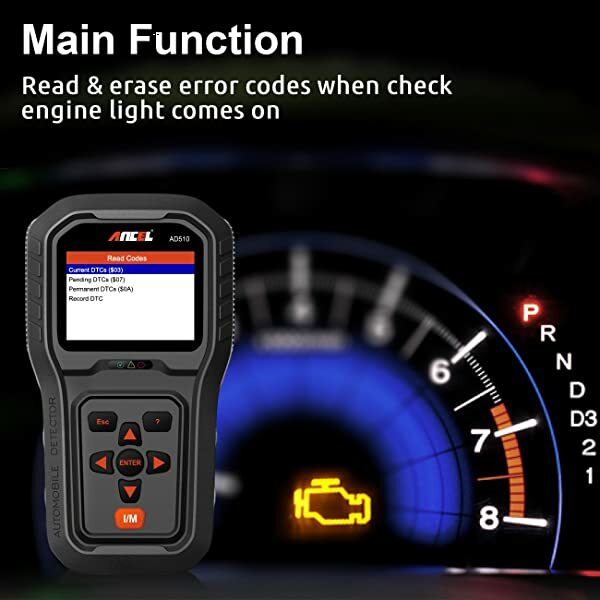 AD510 can read and erase error codes when check engine light comes on. Compatible with Windows XP, 7, 8, 10. Offers special functions like I/M readiness test, battery monitoring and vehicle identification. Provides live data on a screen and LED notifications. Doesn’t have a built-in battery. You have to rely on the car’s battery to run scans. Can’t diagnose other primary vehicle systems like ABS, SRS and transmission. 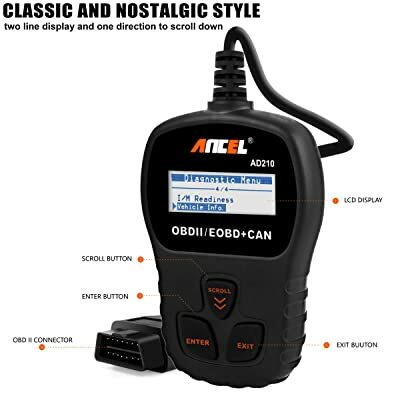 Looking at the functionality and price of this Ancel code reader you can tell that it’s meant for ordinary car owners. It is a basic tool for resetting the MIL and performing the essential tests. Definitely not good enough for professional technicians but more than sufficient for a car owner. Undoubtedly one of the most affordable Ancel code readers you will find, the AD210 takes you back to the basics. No complicated functions, no overkill features. Just a simple-to-use scanner for turning off the Check Engine Light and running I/M monitor readiness tests. 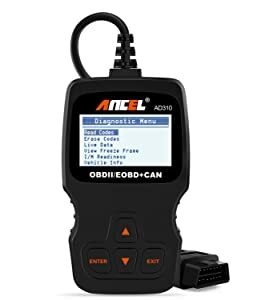 Ancel’s AD210 is an OBD2 code reader. That means it works on OBD2 compliant vehicles. More specifically, the scanner supports 1996 and newer US-made as well as 2000 and newer Asian and European-made vehicles. It is primarily a code reader for reading and erasing ECU codes. One of the best things about the Ancel AD210 is that it has a database of code definitions. You won’t need to go online to find out what each code means. In addition to codes, the Ancel scanner also performs I/M readiness monitor tests and retrieves vehicle information (CVN, VIN, and CIN). A solidly built scanner, the Ancel AD210 measures 9.1 x 7.1 x 1.4 inches. It weighs 10.4 ounces, which makes it a handheld device. Scan results are also displayed on a 128 x 32 pixel LCD screen. Ancel AD210 has two line display and one direction to scroll down. Very effective at resetting the Check Engine Light. Lookup library makes diagnostic tasks easy to understand. Doesn’t support diagnosis of other systems beyond engine. 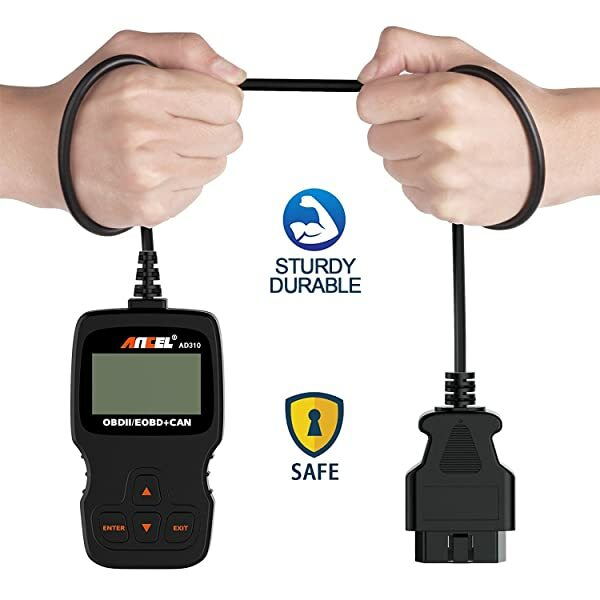 In short, the Ancel AD210 is a consumer code reader that’s ideal for ordinary car owners. Most consumer cars and some SUVs and light trucks and minivans work with 12V batteries. 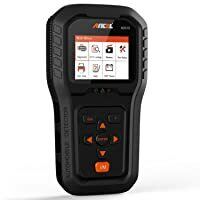 Unless you’re dealing with a heavy-duty vehicle chance are this Ancel code reader will be compatible with your vehicle. So the fact that it doesn’t support vehicle other than those running on 12V batteries shouldn’t be an issue. Overall it is a fantastic tool for keeping your vehicle’s engine health at its best. If you’re looking for a code reader that supports both lightweight and heavy-duty vehicles then you’ve found it. As far as vehicle compatibility goes, the HD510 is designed to meet the needs of everybody. Its functionality is not far off from perfection either. 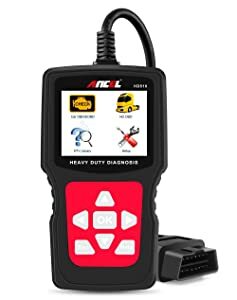 You can use it to turn the Check Engine Light off, read live data streams and perform the most essential diagnostic scans. The code reader is designed for OBD2 compliant vehicles. It works on US-made vehicles that were manufactured from 1996 to date as well as Asian and European vehicles made from 2005. While most other code readers only cover cars and lightweight trucks, the Ancel HD510 includes heavy-duty trucks. It supports both 12V and 24V vehicles. The latter category consists of heavy-duty trucks, some of which have diesel engines. Additionally, the scanner works with 6-pin, 9-pin and 16-pin OBD2 connectors. The only thing more impressive that the HD510’s compatibility is its functionality. In a nutshell, the code reader supports all standard OBD2 protocols available in cars and heavy-duty trucks. Additionally, this Ancel scanner performs I/M readiness tests, provides freeze frame data, PCM live data, retrieves vehicle information (VIN, CIN and CVN) and monitors battery power. A 1.86-pounder, the HD510 is light enough to carry around as you work on a vehicle. It is a handheld device that measures 10.5 x 7.3 x 2.9 inches. On the front side is a crispy clear LCD display and buttons. It’s also easy to operate and features just seven buttons. Four are for navigation (up, down, left and right), one for selecting a menu item and one for exiting. There’s a dedicated button for providing code definitions. You can switch between English, French and Spanish menus. Supports cars and heavy-duty trucks. Rugged and solid construction for durability. Easy to use and provide code definitions. Comes complete including 6-pin, 9-pin and 16-pin OBD2 connectors and a user manual. Updates easily using a USB connection to PC. Doesn’t support a diagnosis of other essential systems, particularly SRS, ABS and transmission. It may not cover many systems but the Ancel HD510 is still a great acquisition for car owners. This is the best Ancel scanner for anybody who drives a lightweight or heavy-duty vehicle. 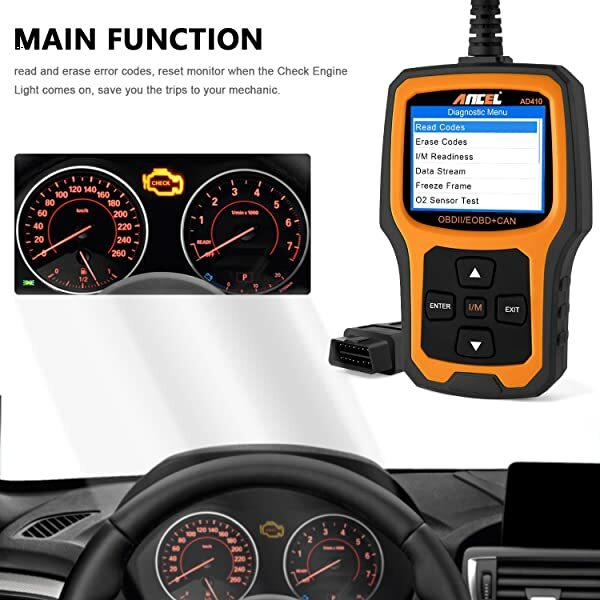 Moreover, with it in your car you will always be able to read engine codes and find out the cause of the Check Engine Light without necessarily having to go to a mechanic. Plus it will help you run emissions tests. Overall, the AD410 just edges the other code readers for several reasons. First, it is compatible with virtually all US, Asian and European-made OBD2 vehicles made from 1996. Most other code readers only cover Asian and European vehicles made from 2000 or 2005. It is also a very practical diagnostic tool with an amazing functionality. 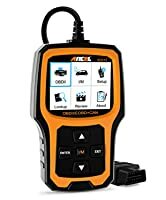 Besides codes, this best Ancel code reader also supports I/M readiness, O2 sensor, on-board monitor and EVAP system tests. Plus it retrieves vehicle information. All those features are bundled in a very affordable unit. You will part with just over $20 for this Ancel scanner. Not many diagnostic tools are this affordable. Even so, it supports reading and erasing ECU codes, I/M readiness tests and retrieval of vehicle information. Ancel AD510 is loved for its simplicity in design and superiority in performance. It combines a rugged construction and handy functional features in an affordable unit. While most consumer-oriented Ancel code readers only read and clear ECU codes, this particular tool tests I/M readiness, EVAP system and O2 sensors. It also monitors the battery. Ancel code readers are fantastic tools. They offer all the basic functions you need in a typical code reader. Equally important is their rugged design, simple-to-use interface and helpful database of code definitions. Even with little to no diagnostic knowledge, you can use an Ancel code reader comfortably. Finally,just make sure the one you pick is compatible with your vehicle and offers the functions you need. The guide above will certainly help you with that.